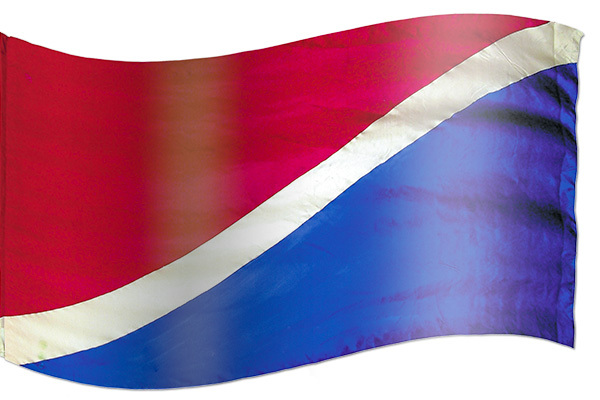 The narrow white stripe that traverses this banner represents the narrow way of integrity. The blue represents the spiritual insight, loyalty, truth and justice required to walk in integrity. The reddish purple speaks of this combining with a life in Christ which gives the strength, courage and boldness required to walk the narrow way of integrity. Walking in a manner that is right in the eyes of The LORD and also in the eyes of man, requires us to deal honestly, justly and righteously and to always express that which is above reproach. To achieve this we must be constantly drawing from and leaning upon The LORD My Rock. Above Reproach, Character, Honesty, Justice, Righteousness, The LORD My Rock.